Hard Drive: Optional: By adding a hard drive to your duplicator it will copy DVDs faster, be more stable, reduce wear & tear, store disc images and unlock controller features. Standard Warranty: All StorDigital products have a minimum 1 years return to base warranty for parts and labour. Karaoke, CD+G Copy Function: Add Karaoke CD+G Copy Option: By enabling your duplicator with Karaoke CD+G Copy functionality you will be able to copy all the most popular karaoke disc format, along with CD Text and ISRC codes. Upgrade to Sony or Pioneer drive: Some customers prefer Pioneer or Sony drives over LG drives. We think LG drives work perfectly. If you wish to enable your device with LightScribe you will need Sony drives, If you wish to do Dual Layer DVD we reccommend Pioneer. StorDigital Duplicators give fast & professional results at great value. The StorDigital CopyTower is one of the most popular duplicators produced by StorDigital, and when you look at its features, build quality and value, it’s easy to see why! Utilising the latest DVD-RW drives, the StorDigital CopyTower is the only choice to consider if you’re looking for a reliable and professional duplication system. The in-built SATA drives offer the highest achievable speeds around for DVD and CD burning, all easily controlled on the duplicator with the touch of a button. The intelligent control centre burns to all 3 drives simultaneously, ensuring all your data is duplicated efficiently and cloned exactly as it should be. Designed as a dedicated duplication machine, the CopyTower operates completely independently. No PC or Mac connection is required for operation, simply plug in the power and you’re ready to duplicate discs in less than a minute. Why not add a Hard Drive to store disc images to the machines memory, upgrade to a StorDigital PrintTower for ink-free printing, or use a StorDigital SafeTower to add copy protection to your DVD-Video discs*. There are a host of upgrades available to improve the capabilities, speed and performance of your StorDigital Copytower even further, call our sales team on 0208 293 0777 for expert advice on your personal and unique requirements. *The StorDigital PrintTower and StorDigital SafeTower do require a PC to run the additionally provided software, but can be operated as standalone systems. *only applicable to Blu-Ray models. *The power supply will differ based on the number of targets. The duplicator will not copy any copy-protected discs. Hi can you tell me if you have a CD DVD Duplicator, StorDigital Premium CopyTower 3 Drive 20X DVD 40X CD Copier [MPN: SD3DVDPRE] in stock with 160 Gb hard drive and a usb connection, and (yeh I know very demanding) if I could get delivery tomorrow (Saturday 05/03/10) I am willing to pay the the extra for a saturday delivery! 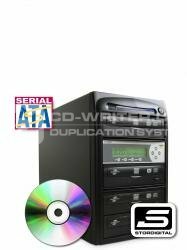 The StorDigital Premium Duplicators have option for 160GB or 250GB HDD. USB connect is available for �35 plus vat. Call us for more info. Hi, Could you tell me if the StorDigital SD3DVDPRE unit comes with fitted hard drive, and also whether it has, or can be fitted with, USB connection for PC transfers. CD . DVD . Duplicator . StorDigital . Premium . CopyTower . 3 . Drive . 24X . 40X . Copier . SATA . Systems .